A feature-filled sedan is a perfect addition to any adventure, whether it be road tripping across the country or exploring the area around you. The Hyundai Sonata is back for the 2019 model year with the latest technologies and a reliable fuel economy that’s ready to take on every adventure ahead of you. 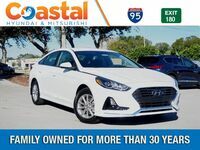 We at Coastal Hyundai want to show you just how much the new 2019 Hyundai Sonata has to offer you. 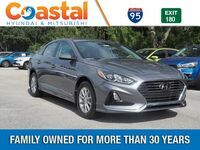 Continue reading to see how well the Sonata stacks up against the competition in this 2019 Hyundai Sonata vs 2019 Kia Optima comparison or click the link below to view our full lineup of in-stock 2019 Sonata models. 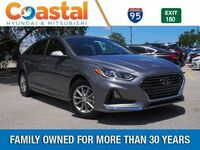 What are the differences between the 2019 Hyundai Sonata and 2019 Kia Optima? When it comes to getting behind the wheel of a new vehicle budget often plays a major role. The 2019 Hyundai Sonata wears an affordable price tag of $22,300 to start its lineup of five athletic trim grades – SE, SEL, Sport, Limited, and Limited 2.0T. Drivers can show off their personality behind the wheel of the Sonata with its seven available exterior color options - Electric Blue, Lakeside Blue, Scarlet Red, Phantom Black, Quartz White Pearl, Symphony Silver, and Machine Gray. The competing 2019 Kia Optima starts off at $22,990 and is available in four trim levels – LX, S, EX, and SX. 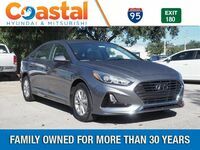 The 2019 Hyundai Sonata hit the market sporting a new cascading front grille along with a redesigned front fascia. The restyled taillights and available LED headlights are sure to make an impact when you hit the road in the all-new Sonata. 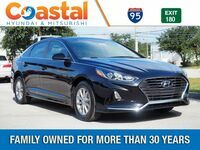 Powered by a 2.4-liter 4-cylinder 16-valve engine with D-CVVT paired with a 6-speed automatic transmission with SHIFTRONIC®, the 2019 Sonata generates a heart-racing 185 horsepower. Under the hood of the 2019 Sonata Limited 2.0T sits a 2.0-liter twin-scroll engine paired with a 6-speed automatic transmission with SHIFTRONIC®, generating an adrenaline-pumping 245 horsepower. The competing Kia Optima is powered by a 2.4-liter I-4 engine paired with a 6-speed automatic transmission to generate 185 horsepower. Passengers are kept comfortable throughout every drive in the 2019 Hyundai Sonata with the help of premium cloth seats, standard in SE and SEL trims. The Sonata Sport features standard sport seats with leather bolsters and cloth inserts, while the Limited trim offers leather seating surfaces throughout the cabin. The elite Limited 2.0T trim offers athletic-looking sport seats with leather seating surfaces to keep drivers and passengers comfortable.